Since the Magical Flying Donkey scales with highest attained riding speed -- that is, it's epic if you can ride epic mounts, regular if you can't, and it will fly assuming you can-- why not just get over it and offer at least partial functionality along those lines for each mount in game? The glowing eyed dumb ones with oversized canines and spiked collars? Not so much. 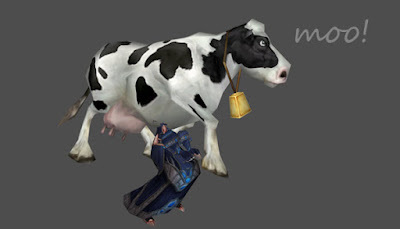 Looking at that big honkin' collar I flash back to Superbowl XXXVIII's halftime show when Justin Timberlake ripped off Janet Jackson's "bodice" and found a PvP mount staring back at him. Anyone else feel attached to the O.G. rides? Am I just being silly? 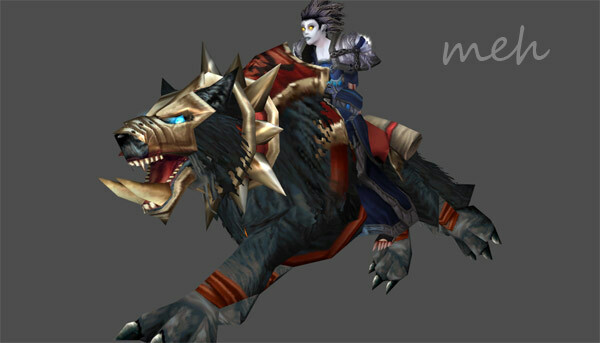 The warlock's dreadsteed makes a solid upgrade from normal to epic, but not everything makes such a smooth transition. I use Livestock to cast random mounts when I mount up, so I get my Zehvra sometimes, and sometimes it's my Black War Bear... but I specifically needed to check 'don't ever break out the old school flavor, because I feel like getting there sometime today' box, which is a little bit of a let down. They're there, their flavor is just sadly diminished. 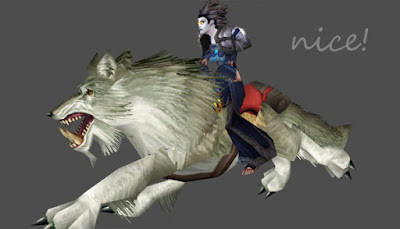 I thought the AV wolf looks just like the black one but in white?? yeah, but all the epic ground speed wolves have armor / glowy eyes. 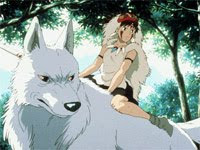 I like the simple Mononoke Hime look. I was waiting for the boat on my Gnome while a Night Elf on his Epic Tiger Mount did what all Night Elves do while waiting for something (bounced around all over the place), so I pulled out my own Epic Tiger Mount (the Darnassus one, not the PvP Mount) and still proceeded to just sit there. Although my Dwarfadin has the Epic Charger Mount, at the moment I like breaking out the Stormwind Epics. He has the Rams, in fact he has all of the Ally Mounts (& the Ambassador title), I just think it's more fitting for a Paladin (even if he is a Dwarf) to ride a Horse. Pet and mount appearance tabs? We've asked for them for gear often enough. Warlock's dreadsteed actually is the same as the wolf. All the epicness actually makes it kinda cheesy. Also, they cut it's tail off. Not subtlety at all. I always wanted the solid white epic steed. But by the time I got to level all they had was the palamino. I'm still sad. If I remember correct, Blizzard has stated that mounts are gonna scale, ground mounts won't become flying, but your lvl 20 mount will be able to move with epic mount speed.